First off, I wanted to remind everyone that the the Boredbrain Music Patchulator 8000 give away is still happening. Do not forget to enter! As I mentioned yesterday, it is officially NAMM season. NAMM stands for National Association of Music Merchants. There are two NAMM conventions. One in the winter and one in the summer. The winter NAMM is the biggest of the two. The point of NAMM is to connect dealers with builders in its most simple form. All music related builders and manufacturers set up booths, meet and network with other builders, and various dealers (large and small) can build and create relationships for offering great products for their customers. During the time of NAMM commonly release new products. It’s an exciting time for everyone. During this time I do receive press releases, so I’ll be posting a few! 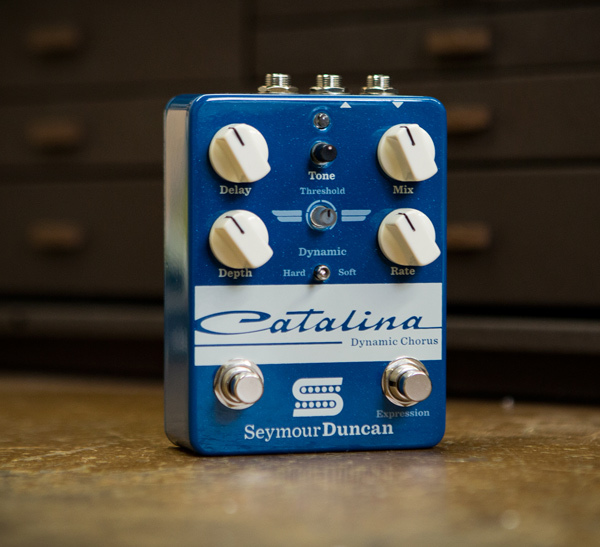 Last weekend I received this announcement by Seymour Duncan about their new chorus pedal – The Catalina Dynamic! SANTA BARBARA, January 17, 2016 – Seymour Duncan, a leading manufacturer of pickups and pedals, announces the release of the Catalina™ Dynamic Chorus pedal. The Catalina effects pedal includes a uniquely innovative Dynamic Expression™ mode that allows you to control the depth of the effect through the intensity of your playing. There’s also a threshold control, which allows players to dial in the sensitivity of the Dynamic Expression feature to perfectly match any playing style.